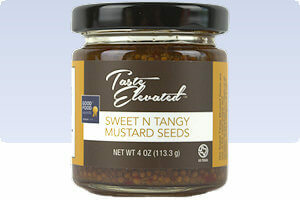 Do you like mustard, then these sweet n tangy mustard seeds may be a great and unique Texan alternative. These mustard seeds are like little flavor bursts in your mouth and make for a unique topping for sandwiches, burger, hot dogs. Great on meat and cheese boards. Ingredients:water, sugar, distilled vinegar, mustard seeds, salt, garlic powder, crushed red pepper.